Is Caitlyn Jenner Transitioning Back To Male – Wants To Be Bruce Again? Caitlyn Jenner is transitioning back to male according to a shocking new report. Star magazine claims that the transgendered Olympian turned reality star isn’t happy as a woman and plans to transition back to Bruce Jenner. The highly doubtful report claims that Caitlyn is doubting her drastic decision and has realized that she should have stayed a man all along. An in-depth report by Star magazine claims that Caitlyn Jenner is regretting her decision to transition and as a result, is more unhappy than ever before. Despite all the attention Jenner has received for her very brave transition from male to female while the world watched, a source told the tabloid that Caitlyn has never felt lonelier. Caitlyn has been secretive about how relationships would work after her transition. Many wanted to know if the newly changed Jenner would be dating men or women after ending a 23-year marriage to Kris Jenner. There have been rumors of a few Caitlyn Jenner relationships including a romance with one of her gal pals Candis Cayne as well as a possible fling with a male driver employed by Caitlyn. According to the report, Caitlyn is not overwhelmed with romance. Actually it is quite the opposite and the E! Network reality star can’t seem to decide who to date. The whole situation is just awkward because Caitlyn is female now but still loves women. That is awkward for a lot of ladies because of Caitlyn’s former gender and rumors that the reality star still hasn’t fully transitioned. Apparently even with all the love rumors, it’s lonely at the top. Caitlyn has been honored numerous times in 2015 for her heroic decision to transition. From the EPSY’s Arthur Ashe Courage Award to the most recent nod as Barbara Walters’ Most Interesting Person of 2015, the attention given to Caitlyn Jenner has been overwhelming. 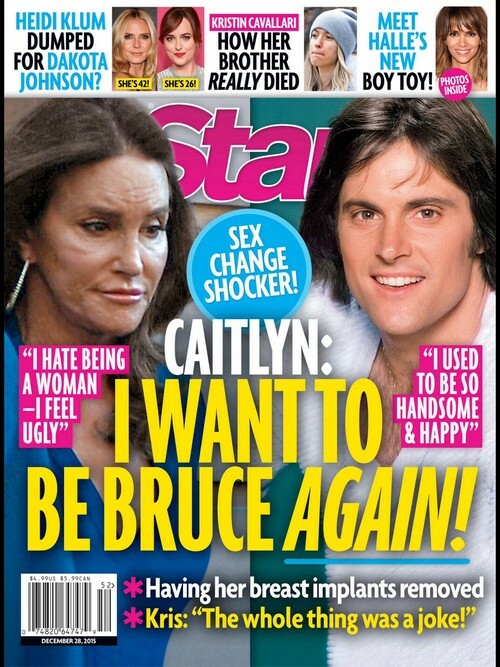 Despite having all the support in the world, Jenner still just doesn’t feel happy and according to Star, she wants to go ahead and change back to Bruce Jenner again. The secret source explained that even though Jenner always dreamed of becoming a woman and finally made it happen, the change just wasn’t all she thought it would be. That said, it’s highly doubtful that Caitlyn Jenner is going to reverse her huge decision and try to become Bruce Jenner again. What do you think? Caitlyn Jenner’s Twitter Accepted Widely After Vanity Fair Cover Debut: Person Formerly Named Bruce Jenner Breaks The Internet! Pregnant Kim Kardashian Bitter and Jealous Over Caitlyn Jenner Vanity Fair Triumph: Clouds Kimye Pregnancy News? Caitlyn Jenner Claims Kris Jenner Emotionally Abused Her During Their Marriage – Denied Her The Freedoms To Transition!